Is it a windsock or a mobile? 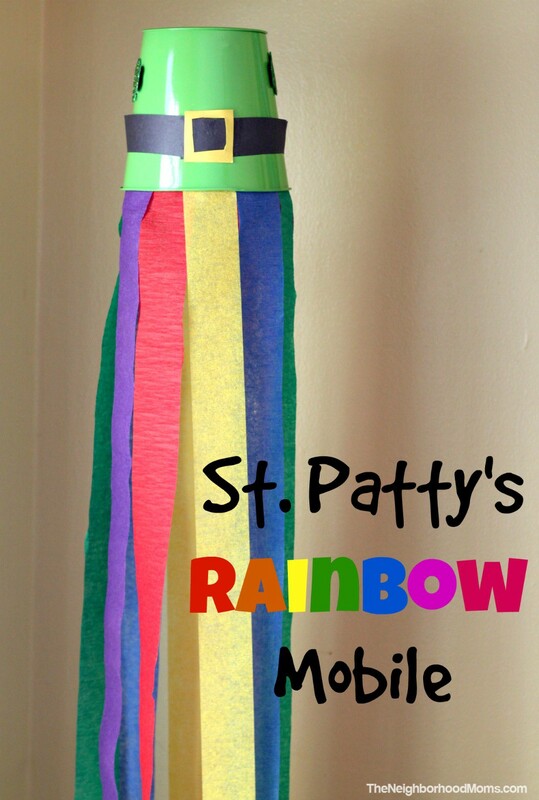 I’m not sure, but I think it is a super cute and easy to do dollar store craft for St. Patrick’s Day! There are many pieces of this craft you could change up to make it more weather tolerant if you want to hang it outside, but I went for easy and available! Just about everything in this craft was purchased from my local dollar store, but the construction paper I had on hand. I found a perfect little green metal pail at the dollar store, so I used that in this project. 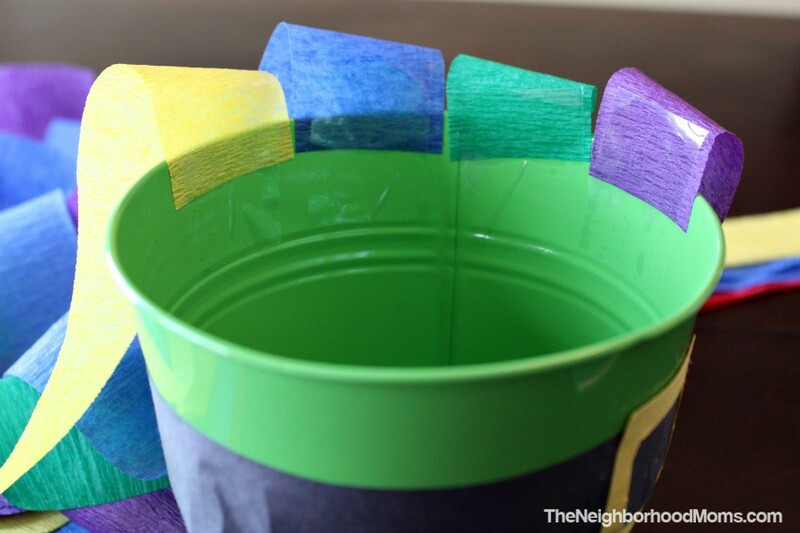 You could use any similar container you can find, paint it green, or make a similar shape out of construction paper. Cut a strip of the black construction paper for the little strip on the hat. I had to do 2 strips to go all the way around my pail. You can tape or glue this to the container. If your pail is angled like mine, you may have a gap on one side due to the curve, just go with it and attach it as evenly as you can. Make the little buckle with a square of yellow paper. If you want your windsock/mobile to be more outdoor friendly, paint the belt and buckle onto your pail, instead of using construction paper! 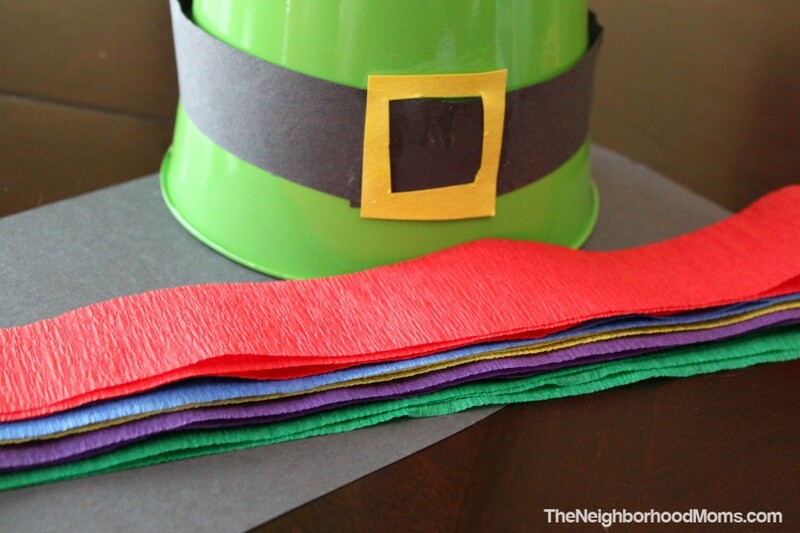 Cut several strips of the streamers to the same length. I LOVE rainbow colors, so just doing this craft made me giddy inside! 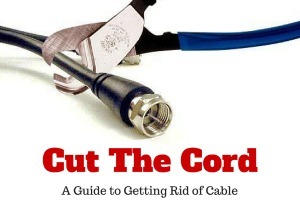 The length is up to you, but go longer than you think, you can always trim them later. Flip your hat over and tape the streamers just inside the lip. I used tape as it was easier to work with since it’s instant, unlike glue. You can go in the ROYGBIV order or do as random as you like. There is no wrong way to do this! I had enough room to do exactly 2 strips of each color, lucky me! If you don’t have a full space at the end, it is ok to overlap a little on the streamer. Flip your hat back over, and attach a string. I popped a little hole in the top with a nail and hammer, and used fishing line to string mine up. For my method: Tie the string end inside the hat to a popsicle stick or similar item, then tie a loop in the other end to hang on a hook. Flip it over, add some sparkly shamrock bling like I did (if you want) and admire your work! How easy!! Don’t forget to check out the other St. Patrick’s Day recipes and crafts some of my blogger friends are sharing this month! Fun Dr. Seuss Crafts for Dr. Seuss Day! That is cute. I was trying to think of fun st patty days crafts/decorations and was coming up blank. Thanx. what a fun and super cute idea! The kids would love to make this. 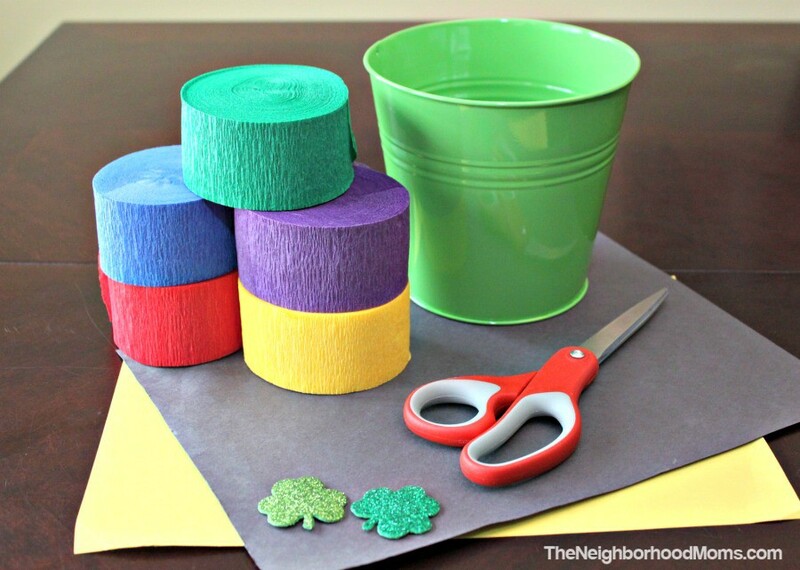 Great after school activity to celebrate St. Pat’s Day. The kids love doing fun crafts.